Cytological evaluation of cervical smears has been carried out in 1675 women attending Gynaecology clinic of Queen Mary's Hospital, Lucknow (January 1981 - December 1995) with complaint of vaginal discharge. This was performed to investigate the incidence of cervical cytopathology and associated infections of sexually transmitted diseases in patients with leucorrhea. As expected, maximum number of cervical smears were found to be inflammatory (57.4%). Cervical dysplasia was seen in 81 cases (4.8%) while malignant cells were detected in 2 cases (0.1 %). Trichomona! infection was associated with maximum number of patients with leucorrhea (8.1%) followed by Candida (2.3%). Among viral infections, cytomorphological changes suggestive of Condyloma was seen in 1.1% and that of Herpes simplex in 0.3% of cases. Concomittant presence of cervical dysplasia and sexually transmitted diseases (STDs) was seen in 16.6% of cases with Herpes, 11.1% of condyloma and 0.3% of Trichomonas infections. The incidence of dysplasia showed rise with increasing age and parity. The study highlights the need for Cytological screening of all symptomatic women complaining of discharge and ascertains the utility of cytology in picking up early cervical cancer and associated causative pathogens in patients with leucorrhea. One hundred and twenty four subjects with intrathoracic lesions were subjected to guided transthoracic FNAC in which 166 aspirations were carried out. The positivity of cellular yield was found to be 81.9%. The slides were stained with Haematoxylin and Eosin,. Papanicolaou and May-Grunwald-Giemsa stains. Results of FNAC were correlated with sputum cytology and histology. Of the 124 cases, 70 were primary malignancies, 10 metastatic, 16 inflammatory lesions, 10 benign neoplasms, 2 doubtful of malignancy and 16 had insufficient material for diagnosis. The overall diagnostic accuracy of FNAC and sputum cytology when compared with histology was 84% and 37.1% respectively. The sensitivity and specificity of the same was however, found to be 84%, 100% and 37.1 %, 100% respectively. Thus, FNAC has been found to be a good diagnostic tool especially when performed with guided techniques. Twenty five patients presenting with dyspepsia over a period of two months were subjected to endoscopy. Brush smears were stained with Giemsa and Half-Gram stain and compared. Endoscopic gross lesions were correlated with presence and density of Hpylori and associated cellular changes in gastric brush smears. Overall H. pylori positivity was 60% in our study. The bacilli were seen in cases of duodenal ulcer (100%), gastric ulcer (80%), antral erosion with gastritis (100%) and antral gastritis (55.5%). 70% of H. pylori positive cases had acute and chronic inflammation, remaining had only chronic inflammation. 5 cases showed focal mild dysplasia of which 4 were H.pylori positive. 5 out of 9 cases of antral gastritis had moderate inflammation irrespective of density of H. pylori. Highest prevalence of H.pylori positivity was seen in fifth decade with decline thereafter. Thus endoscopic brush cytology is useful in detection of H.pylori and associated cellular changes. 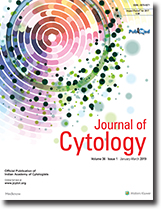 Cytological evaluation of cervical smears was carried out in 1843 women receiving 5 different progestational preparations used as contraceptives for periods ranging from 6 months to 5 years to ascertain theironcogenic potential following long term use. No case of cervical carcinoma was found even after 4-5 years of hormone treatment but cervical dysplasia was seen in 44 cases (2.4%). Follow-up of 33 of the 44 cases with dysplasia while still on contraceptives and 20 cases with dysplasia present prior to treatment showed regression of lesion either spontaneously or after specific medication. The comparative cytological data suggests that norplants are the safest choice for long term use upto 5 years as far as their oncogenic potential is concerned. The object of the present study was to determine the interobserver variability and limits of agretement in the enumeration of AgNOR counts and to differentiate benign from malignant lesions of breast For this work, air dried FNA smears from thirty five cases (27 malignant and 8 benign) of breast lumps were taken for AgNOR counts. The total mean AgNOR dots (mAgNOR) and proliferation index (pAgNOR) were counted by two different observers. The interobserver variation for both the observers were 4% to 9% for mean AgNOR counts and 6% to 12% for pAgNOR counts. The total number of mean AgNOR counts exceeded in malignant tumours (6.705 ± 0.906) than those of benign tumours (1.538 ± 0.374). These values were statistically significant (p0.0002). FNA smears present superior staining and better dispersion of AgNOR black dots in nucleoli as compared to paraffin sections. Fine needle aspiration cytology (FNAC) was done in My one cases with radiolucent lesions of the jaw. In forty five patients the aspirates were adequate fora diagnosis. Histologic correlation was done in 24 cases. There were eleven inflammatory, six benign cysts, five central giant cell lesions, eleven benign and twelve malignant tumors. The overall accuracy was 97.7 percent. There was no false positive but one false negative diagnosis. An ameloblastoma diagnosed on cytology was classified as malignant on histopathology. This study documents that cytomorphology can characterise a wide range of histologically described lesions. FNAC is of particular value in inflammatory lesions like actinomycosis. Reaspiration of cystic lesions especially in the presence of differing clinico-radiologic features improves accuracy. The diagnosis on FNAC is quick; accurate and enables the surgeon to operate on the patient if necessary, as a one-step-procedure. This study presents the fine needle aspiration findings in 138 consecutive salivary gland aspirations over a period of 4 years. The parotid gland was the most commonly sampled. Chronic nonspecific sialadenitis was the most common lesion (37.68%) and pleomorphic adenoma the most common neoplasm (21.73%). No complications were encountered directly from the procedure. The study highlights some of the interesting findings and compares the present series with a few similar studies done in the past. Persistent generalized lympadenopathy is a well recognized syndrome as an early manifestation of HIV invection. The case being presented was a housewife and was a follow up case of Pulmonary tuberculosis. Radiological improvement after ATT was noted though lymphnodes persisted. The lymphnodes were subjected to FNAC. The cytological appearance o f the smears were distinctive of florid follicular hyperplasia along with presence of a few atypical cells to suspect prodrome HIV infection. The case is being presented for these subtle cytological features with their histological correlation. Ultrasound guided needle aspiration cytology of an Undiagnosed retroperitoneal mass was performed in a 52 year old male. The tumourconsisted of solid nodular masses in the hypogastric and para-aortic region. Cytologic features included uniform malignant cells with vacuolation, round nuclei and prominent nucleoli. A few epithelioid cells and Langhans giant cells were also seen admixed with lymphocytes. The diagnostic possibility of seminoma with granulomatous reaction was favoured. Further clinical evaluation revealed non-descent of the left testis and elevated serum BHCG. Histological examination of the partially resected mass confirmed the diagnosis. The rarity of documented reports of needle aspiration cytology of cryptorchid tumors as retroperitoneal mass prompted us to record this case. Diagnosis of pilomatrixomas by FNAC is difficult The criteria for diagnosis are still not clearly delineated. Hence we report a case of a 45 year old wale presenting with a mass in the submandibular region diagnosed as pilomatrixoma by FNAC and confirmed by histopathology. During the period Jan 1990 to June 1996 we encountered.504 cases of malignant tumors of the breastonFNAC. Of these, 5cases were lymphoproliferative malignancies of the breast-4 were Non-Hodgkins Lymphoma (NHL) of the breast and one case was Chronic Lymphatic Leukemia (CLL) infiltrating the breast and producing bilateral masses. Of these patients, one was diagnosed as NHL of tonsil with the involvement of cervical lymph nodes (Stage HA) two years back. She received courses of radiotherapy and chemotherapy and was in remission. She came to us with a lump in the right breast which was shown to be NHL on FNAC. There were 3 cases of large cell lymphoma, 1 case of plasmacytoid lymphoma and 1 case of CLL involving the breast. All the patients were females in the age group 55 to 59 years. Histopathological confirmation was obtained in 4 cases. A case of sacrococcygeal chordoma was diagnosed on the basis of smear preparation and confirmed by subsequent histologic studies. The smears in chordoma are usually hypercelluar: The main cellular forms in chordoma are physaiiferous cells with mucinous, myxoid background. Chordoma is an uncommon neoplasm arising from notochordal remnants. Here, the cytologic features of chordoma and the diagnostic utility of FNAB are presented. Rhinosporidiosis can be diagnosed on the basis of fine needle aspiration cytology (FNAC). It is a chronic inflammatory disease characterised by hyperplastic polypoidal lesions of mucous membrane predominantly nose, oral cavity, conjunctiva and rarely skin and viscera. It is more common in males in the age group of 13 to 40 years. Cytologically, this condition is diagnosed by the presence of large number of round endospores of R. Seeberi with thick wall and transparent capsule and the spherical spores vary in size.